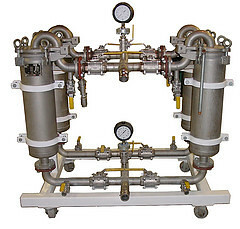 Precision Filtration Products supplies original and direct interchanges for ALL types of industrial filters and filtration systems as well as for commercial and residential applications. 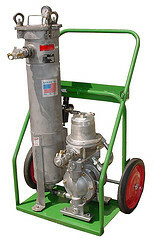 Some of our products include air filters, such as fiberglass and synthetic panel filters, dust collector bag and cartridge filters, HVAC filters, HEPA filters, blower filters, compressed air filters, coalescing filters, exhaust filters, and vacuum pump filters; air, gas, and liquid filtration systems for the chemical, petrochemical, utilities, manufacturing, power generation, pharmaceutical, electric, automotive, fertilizer, glass, food, and beverage industries; aviation and hydrocarbon filters, including clay treaters, filter separator and coalescer cartridges, fuel monitor cartridges, micronic pre-filters, sump cartridges, and oil-water separators; biodiesel filters, including SVO (straight vegetable oil) and WVO (waste vegetable oil) drum-top filters; custom OEM / private label filtration products, including panels, cartridges, elements, discs, bags, HEPA media, pleated paper, pleated polyester, polypropylene, and wire mesh; various types of fasteners and seals for the industrial, commercial, construction, aerospace, military, marine, and automotive industries; gas filtration for sampling systems, analyzer applications, removing liquids and solids, carbon dioxide purification, alternative fuels, steam filtration, compressed gas, and natural gas; hydraulic and lubrication filtration, such as fluid conditioning equipment, suction filters, suction strainers, pressure filters, return filters, pilot line pressure filters, duplex high- and low-pressure filters, off-line filters, and breathers; liquid filters and filtration systems for process water, waste water, carbon filters, hydraulic systems, coolant filtration, lube oil, amine filters, petroleum blending and refinining, coalescing, separating, clay bags, clay canisters, pipeline filtration, and strainers; oil purification, such as vacuum dehydrators, Gulfgate Equipment OEM filters, parts, and service, ASME-certified vessels, lube oil systems, separators systems, flushing skids, pumping stations, and cooling/heating systems; pipeline and refinery filtration systems, such as particulate filters, clay treater filters, two-stage coalescers and separators, strainers, natural gas pipeline filters, available as permanent installations or emergency filter rentals for pigging operations; plastics industry filters for applications such as injection, extrusion, thermoforming, and blow molding; mobile filtration / portable filter carts for particulate and water removal, turbine oil conditioning, refineries, hydraulic reservoirs, gear box and system flushing, replenishing new fluids, varnishing, liquid coalescing and separating, and recycling oil; surge and pulsation control products (Young Engineering & Manufacturing) for surge suppressors, bladder surge tanks, pulsation dampeners, and bladder accumulators. 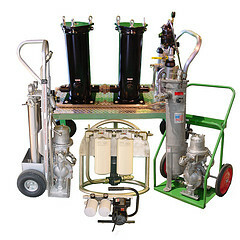 Hi: I have small fleet of diesel trucks and I will like to start cleaning my oil (WMO) I need a system to process about one barrel (WMO) per day But it has to be a system where I do not have to throw away filters I want to be able to clean them and re-use them again. About the final product, I can make base oil or an additive to make diesel fuel. Please keep on mind that this is small company and I don´t want something to big or expensive. Thanks for your comment. 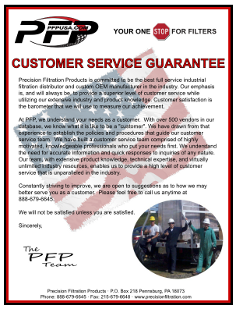 We believe we can help you out, but we would need to speak with you further. Please contact us directly to speak in more details. Hi: This is Walter from Honduras. It is very difficult for me to get in touch with you by phone, but if there is anything that you need to know, please let me know and I will try to illustrate by e-mail. Thanks. También podemos comunicar en español. No hay una necesidad ponerse en contacto por telefono. Simplemente llene el formulario en nuestra pagina de contacto (http://www.precisionfiltration.com/contact.asp), haga clic en “Submit”, y lo recibiremos por correo.